The Laser Institute of America’s (LIA) bimonthly newsletter, LIA TODAY, has released its 2019 Guest Article Guidelines. 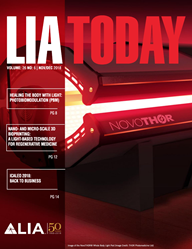 LIA TODAY is a digital publication with a rich history of promoting the latest in laser materials processing, safety, medical applications, research and development, history, and business. “Authors interested in contributing to the LIA TODAY should review the guest article guidelines and contact LIA,” says Liliana Caldero, an editor of the publication. With the industry’s constant growth, thousands of scientists, manufacturers, vendors, and end users of lasers and photonics are searching for all things innovative in the field. In order to meet this surge in demand, LIA is seeking newsworthy content that covers challenges and innovations in the field of photonic materials processing, laser safety, and laser market trends. Topics and industries of interest include energy storage, aerospace, DoD non-aerospace, automotive, medical devices and biotechnology, microelectronics and integrated circuit fabrication, Internet of Things, and research and development. The latest November/December 2018 issue of the LIA TODAY encapsulates LIA’s 50th anniversary celebrations, a record-breaking ICALEO, through to articles on nano-scale and micro-scale 3D bio-printing. This, as well as all previous issues, can be read online via the official website. To learn more or to submit to the LIA TODAY, please see the full 2019 Guest Article Guidelines.